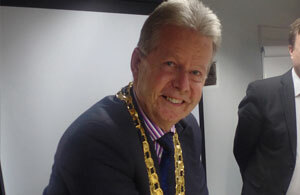 The Mayor of Hailsham welcomes invitations from local organisations for appearances in an official capacity. All invitations will be presented to the Mayor and you will be advised as to whether attendance by the Mayor (or in their place, the Deputy Mayor) is possible. The Town Mayor is able to represent Hailsham at a wide range of functions and events organised by local businesses, schools, youth centres, voluntary and community organisations, cultural groups and registered charities. If the Town Mayor is required to engage in an oral presentation at any function, they should be supplied with as much information on the relevant subject as possible. You can request an appearance from the Town Mayor or Deputy Town Mayor by contacting David Saxby, Hailsham Town Council, on 01323 841702 or emailing david.saxby@hailsham-tc.gov.uk. Alternatively, you may wish to write to: The Town Mayor, Town Council Offices, Inglenook, Market Street, Hailsham, BN27 2AE. We will endeavour to contact you with a response within seven working days from the date the invitation is received.